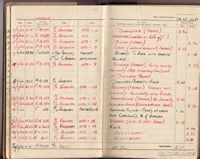 Below are pages from a sample of 550 Squadron air-crew log books. These show various pre-operational, training and live operations during 1944-1945. Where a small (lower resolution) and a large (higher resolution) picture is available, then either or both can be accessed to see the details. The smaller will be a faster download the larger will take longer, but the clarity is excellent in either version. See also these examples of navigator charts and logs for the Politz Raid. S/Ldr Kevin MacAleavey was the Squadron Senior Navigation Officer and then Flight Commander "A" Flight, and was also a member of the F/O Beeson crew after the regular navigator fell ill; he flew a missions with this crew until he "caught a packet" and ended the war as a PoW. 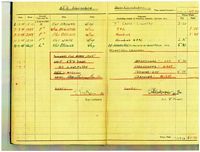 The log book entries available cover both operations from both before he joined 550 Sqdn (with 144 Sqdn and training) and then his flights with various crews in 550 Sqdn. To find out more click on the image or click here. Pages from flight log book of F/O Parker (F/Eng) with the F/Lt Walters crew while with 550 Squadron (May 1945). Pages from flight log book of Sgt Stanley Wright (F/Eng) with the F/O Hutcheson crew. Pages from flight log book of W/O Denis Porter (A/B) with the P/O R Vaughan crew while with 550 Squadron (1944-45). Pages from the log book of F/Sgt Morley flight engineer with the P/O A G Elliott crew. Pages from flight log book of S/Ldr (later Wing Cmdr) Frank Hume while with 550 Squadron (1945). Pages from flight log book of F/O Hetherington RCAF (W/Op) with the F/Lt A W Browne crew. F/Lt Edward Greer Fleming RNZAF, spent about three and a half years in England as a flying instructor with the RAF from around August 1942. He travelled to a number of bases and in September 1944 he went to #28 OTU in Wymeswold. In February 1945 he went to #1656 HCU at Lindholme in Yorkshire flying Lancaster MK I's (he had completed 1180 hours flying by then). The log book entries available cover both live and training operations. F/Lt James Cassidy DFC* (RAAF) flew a full tour with 550 Squadron (following a first tour with 626 Squadron flying out of RAF Wickenby) as the navigator with the S/Ldr Caldow crew. The two documents below list the operations he took part in from the time he joined up (6th December 1941) until he was de-mobbed (27th February 1946). Pages from F/Lt Cassidy's log book. Pages from log book of P/O Walmsley mid-upper air-gunner with the F/O Roberts crew. Pages from the log book of F/O Fletcher air-bomber with the F/O F J Cox crew. Pages from the log book of Sgt Hopper mid-upper air-gunner with the F/O E V Sage crew. Pages from the log book of Sgt Craigs rear air-gunner with the P/O A G Elliott crew. Pages from the log book of F/O Caswell air-bomber with the F/Lt N L Rose crew. Pages from the log book of Sgt M H A Campbell rear-gunner with the F/Sgt H C White crew. Pages from the log book of F/Sgt E Ashley a wireless operator who flew with a number of crews including the F/Sgt C L Cochrane crew (and others). Described below are a number of operations carried out by RAF Bomber Command, accompanied by diary excerpts recorded at the time. Operation Manna was an Allied operation to drop supplies to the starving Dutch people as the Germans withdrew in front of the Allied advance. 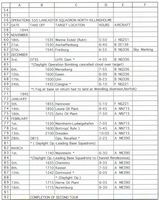 See Operations Manna and Chowhound and Operations Manna for general information about the operations. The following excerpt is taken from F/L Fleming's diary describing his Operation Manna flight on 4th May 1945. Carried out in May 1945 Operation Exodus involved flying recently released Allied PoWs back to the United Kingdom. The following excerpt is taken from F/L Fleming's diary describing his Operation Exodus flight on 7th May 1945. British troops were repatriated back to the United Kingdom from Italy by Operation Dodge. See also: Operation Dodge for photographs. The following excerpt is taken from F/L Fleming's diary describing his Operation Dodge flights in August 1945. Operation Spasm was run by Bomber Command out of RAF Mildenhall in late ’45, as a sightseeing tour over Berlin; so one of the so-called "Cooks Tours". There doesn’t seem to be much recorded information on the operation. These were not tours for the general public - they were run to allow ground personnel and others to see the damage that had been inflicted on Germany first hand. From the log books of individuals it appears that there was 550 Sqdn involvement with this particular operation with flights from Base to Tibenham and then to Berlin-Gatow and back, and involving an overnight stay in Berlin. The following excerpt is taken from P/O Walmsley's log book recording his Operation Spasm flights, with F/Lt "Jock" Shaw as pilot.